Even the kids are enjoying the great charter fishing that has going on the past few weeks. As many folks are coming to Naples, Florida for their spring break or Easter vacation the kids have been catching their share! 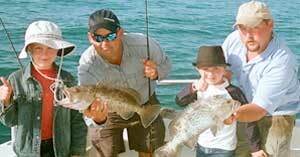 All of our fishing charters are “child friendly”, departing from the Port of Call Marina here in Naples. As of late we’ve seen outstanding catches of grouper, snapper, king mackerel, Spanish mackerel, cobia and sharks. The king mackerel are so abundant that we are catching limits while grouper fishing over reefs. The deep sea fishing should stay extremely good for the next month or more. We expect the permit to show up this week on the offshore ledges and wrecks.